Here is the promised tutorial to make this cardigan in your size, with your yarn choice using knitware software to generate the pattern. A free demo is available to download here. The demo is fully functioning and will allow you to make the cardigan with any yarn, in any size but will not allow the pattern to be saved. The best way to save the pattern is to select all, copy and then paste into Word. I really like this program (no affiliation!) and I have purchased the full version (there are a few extra functions not available on the demo version) – I think it is worth every penny! 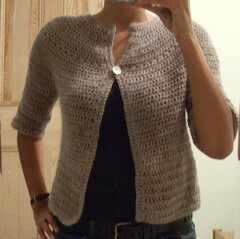 I used approximately 300g of a DK weight Teo Handspun 100% alpaca yarn for a woman’s size 36″ garment. Crochet a Tension (Gauge) square about 6 x 6 inches in main stitch pattern using hook size to give desired drape. Measure number of stitches and rows over 4 inches. My gauge was 12 stitches x 10 rows. You can also fill in information about your yarn type, and start and finish dates, but these are all optional. Check the Finished Dimensions data and adjust if necessary. I wanted a slightly wider neckline so I increased the neckline slightly from 7.8 iches to 9 inches. Click the pattern tab and your pattern will be generated. There is an option to estimate the yarn required, but I have found that this usually overestimates. Once your pattern is generated you will need to make a few changes. Add the Eyelet yoke stitch pattern about half way down the yoke instead of Row 2 of the main stitch pattern. My yoke had 22 rows and I added the Eyelet Yoke stitch pattern on row 14. When working the sleeves, instead of Chaining for the underarms, you can just work into the Chain stithes you made when separating the yoke. Ignore the finishing instructions! For my cardigan instead of fastening off when I finished the body, I worked double crochet in the round along front bands, neckline and hem for 3 rows. I made a button hole about half way down the yoke adjacent to the eyelet yoke stitch pattern row, by chaining 2 on the second row and then crocheting into the chain on the third row. This pattern can be easily modified by using different stitch patterns, sleeve and body lengths etc.. A nice variation would be to put a few more openwork rows into the yoke – there are endless possibilities. Once you have divided the yoke, you can (and should) try the cardigan on to make sure you are happy with the fit. Please let me know if there are any problems with this tutorial by leaving a comment, I will try to answer any questions as soon as possible. Very pretty! I love the top portion of the sweater. I haven’t seen anything like this yet. Thanks so much for posting this. I really appreciate the time you’ve taken ~ especially considering that it’s so close to Christmas. This is great. I really want to make one. Thank you!! Can’t wait to make this one either. I too have some knit software, a b’day present from last year: I have Cochenille ‘s garment designer but I haven’t used it yet.. oops and I ‘ve had it 9 months now…. I post free patterns on my blog too , I have 2 daughters too , I trained as a doctor too but also as an accountant and now I work as the latter and I’m near Oxford…..I LOVE CROCHET!!!! I love your site, all your patterns are so pretty and the finished projects look really professional. I am definitely inspired! I keep re-going over the archives and am impatient for March 08! I’m going to start the Manos shawl now with some Rowan Romance yarn – bought at 1.00 a ball from Peter Jones in Sloane Square (near to my work). There was a full bag of 8 balls and I bought the lot! Half will be donated to Ma and we can muddle along together – muddle being the operative term! Keep up your lovely site – it is truly inspiring and well done with all your pretty projects. I think this is the most wearable crochet cardigan I’ve ever seen. But the software doesn’t run on a Mac. I’d definitely pay for this pattern on Ravelry or Etsy. Any plans to make it available? Gorgeous. I love this cardigan, and I’m just starting a swatch to try and make it. Is it ok if I link here from my blog? Thanks! No problem! Hope your cardigan turns out well. I’ve downloaded the design software, but I notice it says that the round shoulder yoke is disabled, so this would not work unless you pay for the program to be unlocked! Softeware looks better than the sweater wizard I was using though, so I might just do that. Belinda, are you sure? When I downloaded it, the round yoke options were disabled (i.e. the options to vary the number and spacing increase rounds), but the standard round yoke shaping was enabled. Have a look at it again, you should be able to choose standard round yoke shaping as an option. What a beautiful cardigan. I was wondering if you could help me. How can I get acces to the free pattern for this model? Do I have to use the design software for this? Thank you so much for your explanation and your links. I have started my cardigan, and I hope it will turn out just as beautiful as yours. Hope you don’t mind that I have linked to this post in my blog, I like to tell people where I got the ideas to my work. The whole weekend, I have tried to understand and loads down fillets – but I could not find out anyway. My English is not so good, but I wonder whether you have the pattern to cardigans? Hope that you can explain a little short on how I can come up. What’s the name of the file, I can download? Hope not that I do so difficult? Hi again! I’ve finally finished the body of my cardigan, but the front edges are not straight: they go straight down, then slant away from each other. I noticed you used one button, is that because your’s did the same? There are pictures on my blog. Thanks! This is a beautiful cardigan and I can’t wait to get started! However, I work on a MAC and the software is not compantible with MAC. Would you be able to post the free pattern in standard sizes? Thank you! Too cute! I am so making this! Thanks for sharing!!!! Thank you for designing this sweater. I really love it. I am afraid I just don’t understand the software. Do you have the pattern available elsewhere. I believe the pattern you used would fit me just fine. Thank you. Thanks so much for posting this, even if I only just found it via Ravelry! I’ve downloaded the software, put in my variables, and love it! I’ll probably purchase the software when I can find the funds. BTW, your patterns are lovely. I can’t decide whether to start this sweater or the chevron lace sweater – or perhaps work on one of my MANY UFOs (musing to self…can’t do that, it would make far too much sense). I’ve also saved your two shawl patterns for later use, like when the two sweaters mentioned above are either complete or on the UFO pile. 😐 I will have to continually check on Ravelry to see if you’ve invented any new chic designs … don’t feel any pressure, ’cause it may take a while for me to finish those already in queue! I think you should create a pattern and then sell it to a magazine so that I can see it without having to download the program. Ok, so I caved and downloaded the knitware program. I don’t know where you put in the stitch type. On the pattern that I generated it says: [W2, M1] once, then [W1, M1] 3 times…. instead of putting in stitches. Where did I go wrong?? Thank you so much for the tutorial and pattern. I finished my cardigan today. Such a useful pattern and a very nice model. I’d love to make the cardigan (it looks soo beautiful) and finally managed to dowonload the correct file (I found that it has to be the “sweater design” – I had first tried the basics…silly) but now I got stuck: what size measure 36 do you refer to? is it 36 in german sizes equivalent to 10 in UK? or italian/french/spanish? I checked the size lists in the program, but the measurements are quite weird: If I chose size 40, the waist is only 31,5 cm, which isn’t even the half of my waist. In the program itself you can only chose betwen “women 76” up to women 142- do you know what sizes these are? I’m quite confused. The size 36 relates to bust mesurement. One nice thing about the software is that it gives finished dimensions and you can change the ease so that it is a closer or looser fit. I love your crochet sweater, would it be possible to get the pattern without downloading the softwear. I like this and want to make it but the knit program just won’t download. It’s the sweater one I need right? That’s the one that I can’t install. I can only download the zipped file and then I can’t do anything more.